Strong thunderstorms, large hail, flash floods, and high humidity made Washington's July weather seem more like summertime in the Midwest than the Northwest. An unusual weather pattern consisting of unstable southerly flow led to an abnormally stormy period during the third week of July. Active weather began in earnest on July 14th, and continued for one week, before culminating with a final and memorable severe weather outbreak on July 20th. As warm, moist, and unstable air was lifted by an incoming cold front, severe weather erupted over south central Washington at around 12:30pm before moving north-northeastward through the afternoon. The area immediately north of Sunnyside was hit hard with a severe thunderstorm that dropped a record 0.73 inches of rain in fifteen minutes, along with golf ball size hail. There were several reports across eastern Washington of large hail of greater than 1.5 inches in diameter. There was significant spatial variability of the agricultural impacts of the severe weather. While some orchards were devastated by crop losses nearing 100%, other sites only a few miles away received minimal hail damage. Areas near Walla Walla were also struck with 60 mph winds and large hail, while weather spotters west of Moses Lake reported hail of 1.75 inches in diameter. 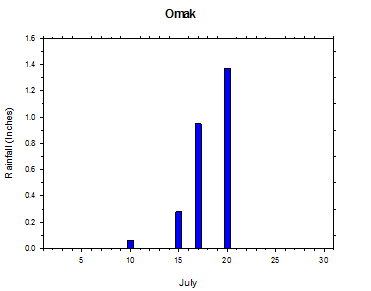 The Omak area (Pogue Flat) received over one inch of rain in the 30 minute period from 2:30 to 3pm on Friday afternoon, July 20th. Other notable and record events occurred during the stormy period leading up to the July 20th severe weather outbreak. On July 14th, a thunderstorm stalled over Pomona, and dropped an all-time daily (1989 to present) record rainfall of 1.7 inches, including 0.56 inches in only 15 minutes. A rainfall-induced landslide caused the closure of Highway 14 between Paterson and Goldendale on July 14th. On the 15th, Malott received a 24 hour rainfall of 2.3 inches, which included 0.73 inches in only 15 minutes. Daily rainfall in excess of one inch was recorded at K2H and FishHook (east of the Tri-Cities) on July 16th, while Omak (Pogue Flat) received nearly an inch of rain on the 17th. Another landslide forced the closure of Highway 821 south of Ellensburg on the 17th. Late on July 19th, Welland received a record 15 minute rainfall of 0.63 inches, although the main action was yet to arrive. Many of these intense, thunderstorm-induced rainfall episodes delivered 15 minute rainfall totals that exceeded the monthly average totals! The second main weather story of the month was the heat wave that occurred immediately prior to the active mid month time period. 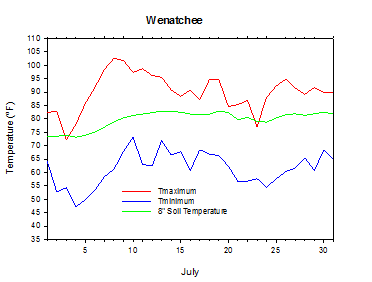 Rapidly warming conditions peaked on July 8th, although oppressive heat continued in eastern Washington until the 13th. Temperatures reached as high as 107 degrees on the 8th, and Sunnyside recorded an all-time (1989 to present) record high temperature of 104 degrees. It was also very humid on the 8th, as Ringold recorded a dew point temperature of a tropical 81 degrees. Western Washington was moderately warm during the second week of July, although temperatures never climbed very high at the coast. The 8th was a very unusual day since it was the hottest day ever to record rain in many locations around the Yakima area. For example, Konnowac Pass received 0.37 inches of rain after reaching a high of 103 degrees earlier in the day. Quincy logged a record (1989 to present) dew point temperature of 78.7 degrees, while many locations in south central Washington experienced muggy dew point readings in the 70s. Most places in eastern Washington were near or above 100 degrees on the 8th, and remained in the 90s and 100s through July 13th. Hot and humid weather caused warm overnight lows as well. Wahluke Slope remained above 70 degrees for seven consecutive days. In general, eastern Washington temperatures were slightly above average in July, while temperatures in western Washington were slightly below average, especially during the day. July rainfall was highly variable and generally above average in eastern Washington due to the strong convective activity during the middle part of the month. 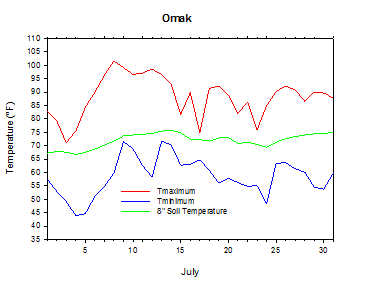 Interestingly, some areas received no rain during the month, while Malott (south of Omak) received more than 3 inches. 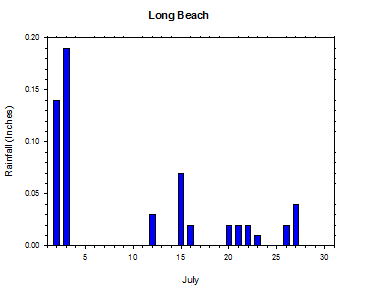 Even the normally wetter areas like Long Beach received much less monthly rainfall than some eastern Washington locations that had experienced downpours during strong thunderstorms. The month began with very cool temperatures, as Ritzville dropped to 33.8 degrees on Independence Day morning. Oppressive heat firmly gripped eastern Washington by July 8th, and continued until the 14th. Following a week of stormy weather, the passage of the cold front and upper level trough on July 20th signaled a pattern change to calmer and more seasonal weather. Drier air and clear skies sent low temperatures down into the 50s or lower, as dew point temperatures dropped into the 40s east of the Cascades. 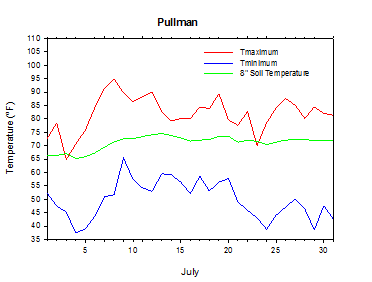 Temperatures at Pullman dropped to a chilly 38.8 degrees on the morning of July 24th. July began with generally seasonal conditions, and mostly sunny skies in central Washington. A dry cold front ushered in cooler and drier conditions on the 3rd. Highs were in the upper 60s and 70s in central Washington, and 50s and 60s in western Washington. Numerous cold sites in eastern Washington dropped into the 30s on Independence Day morning. Ritzville was the cold spot, with a low of 33.8 degrees. A much warmer and more humid air mass invaded the state on July 7th, as the first 100 degree weather of the year affected eastern Washington. By Sunday, July 8th, many areas experienced temperatures in the 90s and 100s, with Mesa SE recording a high of 107.3 degrees! According to the National Weather Service, record daily highs were set at Pullman, Wenatchee, and Moses Lake. Dew point temperatures in the 70s served to exacerbate the uncomfortable conditions. The heat, though not unprecedented, was record breaking in a few cases. Meanwhile, western Washington also briefly experienced much warmer weather; however, marine air quickly moderated temperatures beginning on the 9th. Although conditions were warmer than June, western Washington was spared from prolonged and oppressive heat due to their proximity to the ocean. Later on July 8th, a disturbance moving up from the south spawned a thunderstorm complex that moved through central Washington overnight. Lightning, heavy rain, and gusty outflow winds were observed with the storm cluster. Despite reaching a high of 103°F, Konnowac Pass recorded 0.37 inches of rain during that evening, including 0.27 inches in fifteen minutes. In contrast to the extreme heat observed in much of the state, Long Beach remained cool and failed to reach 60 degrees on July 8th. A few more showers and storms occurred on Monday, July 9th, and then drier and less active conditions returned to eastern Washington by the 10th. The heat wave continued, and isolated areas endured highs of greater than 100 degrees for 5 straight days. Wahluke Slope did not drop below 70 degrees for 7 consecutive days (7th to 13th), and registered a balmy low of 78.6°F on July 9th. Overall, the hottest weather in several years occurred during the week-long heat wave that lasted from the 7th to the 13th. It is very rare for such hot temperatures to be accompanied by thunderstorms and significant rainfall. Normally, Washington's 100 degree weather is associated with strong and dry ridges of high pressure. However, an unusual weather pattern occurred in Washington on the 8th. A weak impulse moving up from the south interacted with an unstable and energy rich atmosphere to produce thunderstorms. Relatively high humidity values indicated that a large amount of total heat energy was present in the air. To illustrate the uniqueness of the 8th, consider the following. In many locations, including Quincy and Mattawa, the 8th was the hottest day ever to record rainfall, and by far the hottest day to record significant rainfall (since 1989). Mattawa reached a high of 103°F on July 8th. Prior to that day, it had never rained on a 100 degree day. 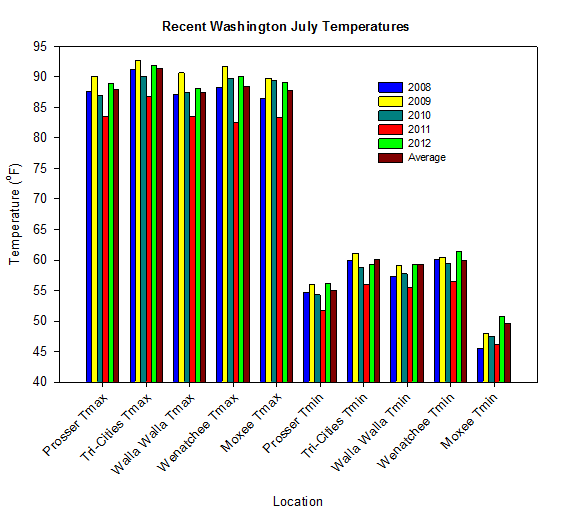 While July 8th was not the hottest day in recent memory in Washington, it was very warm nonetheless. A vast majority of AWN sites in south central and north central Washington surpassed the century mark. This is in stark contrast to last year, when most AWN sites failed to reach 100 degrees during the year. Last July, the hottest monthly temperatures at most locations were in the mid 90s or lower. Following nearly a week of the static weather pattern that featured continuous, unstable southerly flow, conditions began to change late on July 19th. An upper low dropping out of the Gulf of Alaska kicked the west coast upper trough inland over Washington. The approach of the cold front and low pressure system toward an unstable and moist air mass set the stage for a day of severe weather. The preliminary activity began late on July 19th. Welland (east of the Tri-Cities) received a record (1992 to present) 0.63 inches of rain in a 15 minute period, which surpassed the previous record by 0.24 inches. Heavy rain fell early on the 20th across much of western Washington, as WSU Puyallup received around one inch of rain. At around 12:30pm on Friday, the main event began, as severe thunderstorms erupted over south central Washington. Ping Pong sized hail was reported in some areas (National Weather Service). Sunnyside received an all-time record (1989 to present) 15 minute rainfall of 0.73 inches, which smashed the old record by 0.24 inches. As the storms progressed northward, weather spotters reported hail of 1.75 inches in size 3 miles west of Moses Lake at 1:35 pm (NWS). At 2:45 pm, Pogue Flat (Omak) received a station record 0.6 inches of rain in 15 minutes. Areas near Walla Walla reported winds of up to 60mph, along with hail of up to 1.5 inches in diameter. Many regions, including the area north of Sunnyside, suffered significant hail damage and crop loss. The thunderstorm threat ended with the departure of the negatively tilted upper trough on July 20th. A pattern change occurred in Washington on the 21st in the form of a drier and more stable southwesterly flow. A progressive upper low moved over the area on the 22nd and 23rd, bringing the first below normal temperatures to eastern Washington since early in the month. Lower dew points yielded cooler and more comfortable lows in the 40s and 50s. 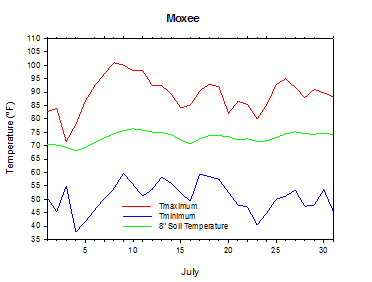 Moxee dropped to 40 degrees on the morning of the 23rd. On the morning of the 24th, Pullman dropped to a chilly 38.8 degrees. Warmer conditions returned on the 24th and 25th. High temperatures climbed into the upper 80s to mid 90s in eastern Washington, and 70s to mid 80s in western Washington. 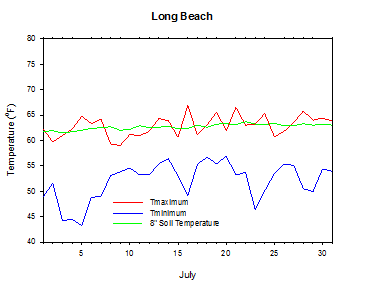 It is interesting to note that the high temperatures at Long Beach never climbed to 67 degrees during the month, which indicates that the cool ocean air was able to insulate the coast from the heat that was present over much of interior Washington. Overall, the month ended with much more typical summer weather than had been observed earlier in the month. While Washington received a taste of extreme heat during the second week of the month, much of the country continued to observe the above normal temperatures which have been commonplace since late last winter. The average July temperature at Prosser (WSU IAREC) was 73.1°F, which is 0.8 degrees above average, and 4.5 degrees warmer than last July. The average high temperature was 88.9°F, which is 1.0 degree above average, and 5.3 degrees warmer than last July. The average low temperature was 56.2°F, which is 1.2 degrees above average, and 4.4 degrees warmer than last July. 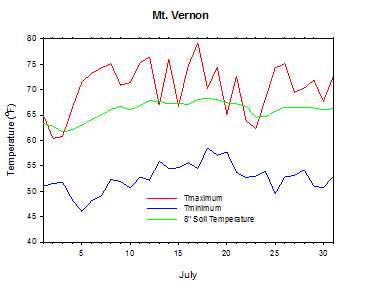 The maximum temperature recorded in July was 101.2°F on July 8th, while the coolest daily high was 72.1°F on July 3rd. Low temperatures ranged from 66.3°F on July 9th to 43.8°F on July 4th. Daily average temperatures ranged from 83.2°F on July 8th to 61.0°F on July 4th. The monthly rainfall total was 0.29 inches. 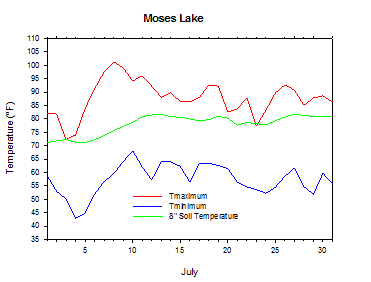 The average wind speed was 4.1 mph, and the average 8 inch soil temperature was 75.6 °F. July 4th: The temperature at Ritzville dropped to 33.8 degrees. July 8th: The high temperature at Mesa SE climbed to 107.3 degrees. July 14th: 1.69 inches of rain fell at Pomona, including 0.56 inches in 15 minutes. July 16th: 1.52 inches of rain fell at Ritzville. July 20nd: 0.73 inches of rain fell at Sunnyside in only 15 minutes. July 24th: The temperature at Pullman dropped to 38.8 degrees. Washington's most significant agriculture-related weather concern during July was the active and stormy weather that occurred during the middle part of the month. July 20th was a particularly stormy day. Strong and even severe thunderstorms developed over south central Washington around 12:30 pm, and progressed to the north-northeast throughout the afternoon. Many locations in eastern Washington reported significant hail-induced crop damage, although the effects were highly sporadic, as is often the case during severe weather. Isolated areas reported crop losses of 25 to 100%. Much of the Chelan County apple crop was also badly damaged by hail, with total loss estimates of up to 20%. Other hail damaged regions included areas from Wenatchee to the Okanogan, Quincy, Royal City, and Mattawa. The July 20th event has been described as the worst hail event in a century in some parts of Washington (Karen Lewis, personal communication). Some estimates suggest that 10 million boxes of Washington apples may have been lost to hail damage (Capital Press). Growers were also told to be on alert for potential fire blight spread in hail-damaged orchards. As a result of the storms, some areas were declared to be disaster areas. Even in non-designated counties, growers that suffered a 30% or greater crop loss will be eligible for emergency loans. Otherwise, winter wheat harvest yields were above average, except in hail damaged areas. High winds of up to 100 mph in Ferry County damaged some crops, and caused power outages. In the Yakima Valley, peaches and nectarines were being harvested, and hops were filling in the trellis and setting cones. Sweet corn harvest began in Grant County, while western Washington sweet corn maturity was several weeks behind schedule due to the cool weather. Hay was finally chopped at the end of July in Asotin County, after being rained on a few times earlier in the month. Cool weather continued at the coast, making for ideal cannery pea growing conditions in Grays Harbor County. The cool weather was also good for the berry crop in western Washington (National Agricultural Statistics Service). On July 12, 2002, the temperature at Prosser (WSU IAREC) soared to an all-time record high of 110 degrees! The Climate Prediction Center (CPC) outlook for August suggests dry conditions are expected, with above normal temperatures likely east of the Cascades, and below normal temperatures likely west of the Cascades. During the autumn, drier than normal weather and near normal temperatures are expected. The ENSO outlook suggests that the development of El Niño is increasing likely by the autumn. There is now a 65% chance that a fully developed El Niño will emerge by the end of 2012, following two consecutive La Niña winters. El Niño winters tend to be less active than normal, with relatively warm and dry conditions leading to below normal snow pack in the mountains.